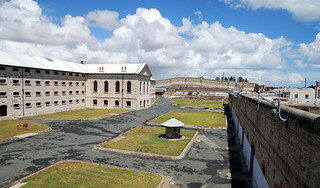 Fremantle prison is well known for its long history as a convict prison but this evening I will recount the tale of one of its more recent inmates. A clever young man by the name of Brenden Abbott, but also know as the ‘postcard bandit’ as dubbed by the WA police media unit. In 1987 Brendan was sentenced to 14 years imprisonment for the robbery of a $112,000 from a Perth bank. Two years into this sentence he managed to successfully escape in a daring manner fitting of a Hollywood block buster. Over many months of planning, Abbott made for himself and an accomplice two sets of clothing each in the prison tailor block. A high ranking prison guard uniform and a set of civilian clothes. Before breaking through a section of roof panel they stripped their outer layer of regular prisoner clothing to reveal the guard uniform. When confronted by a rifle bearing guard in the nearby tower he quickly responded that they were inspecting the roof for security and due to his uniform providing seniority he was able to buy enough time to skip across the roof and jump across a narrow gap to the perimeter wall. The accomplice was not as limber and fell, breaking a leg. Once over the wall he shed another layer of clothing and headed for the centre of town where it is believed he spent a day or more while the police searched further a field assuming he would flee. Abbott was on the run for more than 5 years during which he netted upwards of $6,000,000. The ‘postcard bandit’ name was given to him at this time as it was rumoured that he sent the police postcards telling them of his various escapades. This was vastly generated by the police to gain publicity and aid arresting Australia’s most wanted criminal of the time. In reality the police had simply found a discarded camera with film showing Brendan parading around police stations and the like. Abbott was eventually arrested in Queensland but again managed to escape. His freedom was much shorter lived, being recaptured a few months later. He is currently serving the remainder of a 23 year sentence in Brisbane Corretional Centre. There is talk of him then being required to fulfil the remainder of the sentence for his crimes in Western Australia that went unserved after his escape. An interesting tale which apparently was made into a straight to tv movie back in 2003. We might have to look it up on our return. If you are after a story of a more historic escapee then I suggest reading up on Moondyne_Joe. PeopleWhoDoStuff – Blog Blog at WordPress.com.